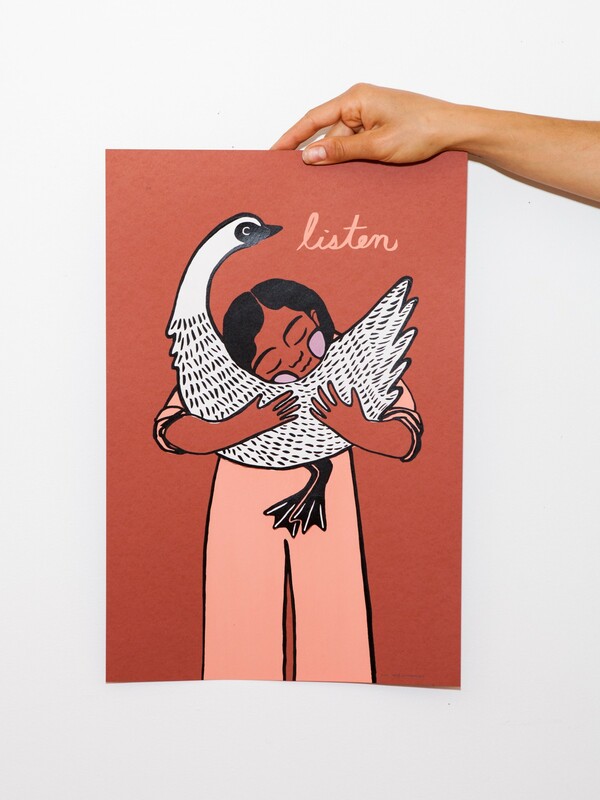 L I S T E N – it is no small gesture, to be quiet and listen to each other, to listen to those that can’t speak, to languages other than our own, to sounds that may not be words at all but tell us a great deal: the rustle of the leaves, a sigh, the heartbeat of a bird. Limited Edition. Signed. Three color screen print on a Brick Red (French Paper) 80 lb. cover stock. Her cheeks, pants & shirt are hand-painted in gouache. Hand screenprinted in Portland, OR by Sonya & Nina Montenegro. Each print is a bit different because of the hand-painted elements – variations will exist. Shipping: Your poster will be safely packaged in a FLAT envelope.